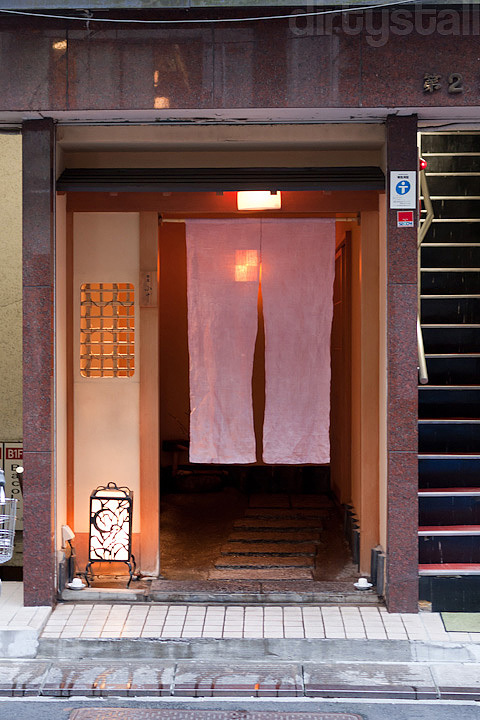 Unlike Singapore where most of the top Japanese restaurants tend to be cloistered in hotels, in Tokyo even the Michelin 3 star restaurants are hidden down obscure alleys, just a door in the face of an nondescript building. 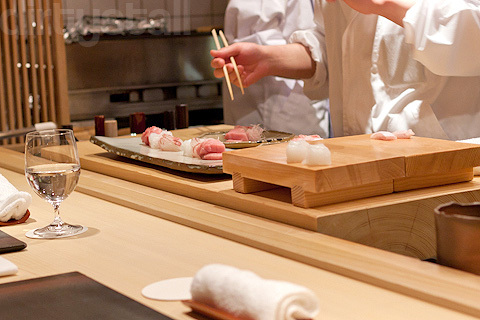 And Koju is one of those hidden away in the Ginza district, quiet and unassuming but with impeccable quality. 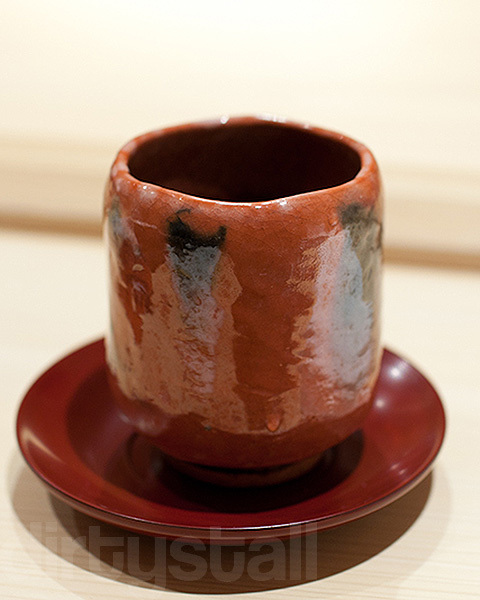 Koju was named after a master potter that the chef Toru Okuda admires greatly. In fact all the plates, bowls and cups are been made by Koju, and most of them cost a lot more than the most expensive meal at Koju – a cup can be about $500 while a plate might be worth around $5000. 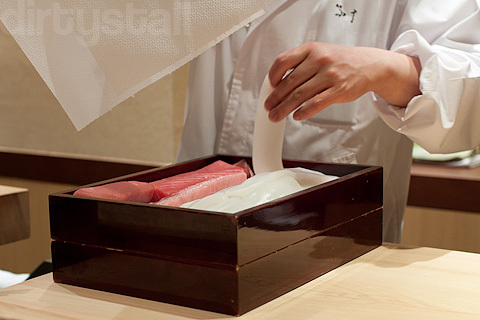 The kaiseki that you find at Koju is not as ritualised or formal as it would be at say, Kikunoi in Kyoto, but the keywords here would be austere and minimalist, as described by ChuckEats. 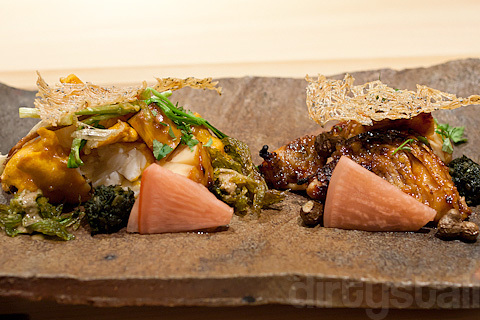 Chef Okuda focuses on the bringing across the absolute quality of the ingredients while keeping everything else simple. Koju is heavily booked – I had to book almost half a year in advance and I was still only given 1 slot within the week that I was in Tokyo. 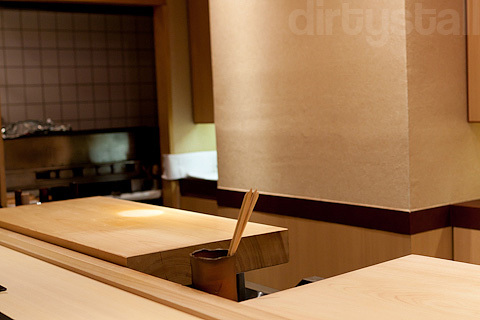 This is exactly the same situation when I booked for the Michelin 3 star restaurant Sushi Saito a few years back. A small surprise was that the lady who came in after me and sat next to me had apparently visited Singapore as a child so it was a nice coincidence to chat about her visit in the past. 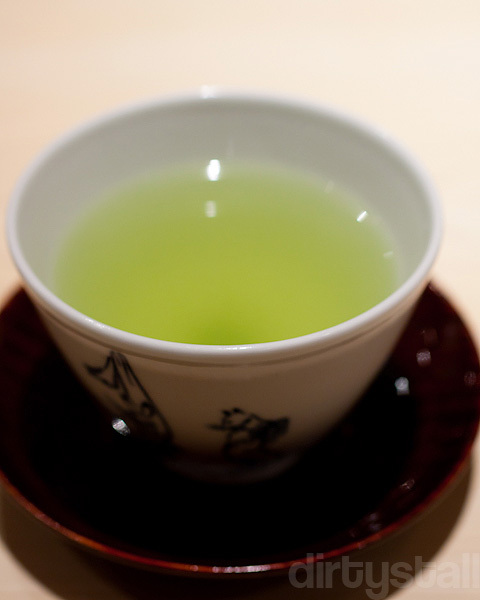 Anyway the kaiseki was about to start and since I don’t drink, I opted for green tea and what was unique was that they gave me a new cup of green tea with every course, in a different cup and a slightly differently type of green tea each time. The opening appetizer was a salad mountain of 山菜, 13 different types of mountain vegetables covering some raw tairagai (pen shell). The vegetables were fresh and surprisingly tasty, because I really hate eating greens. Chef Okuda told me that this was actually the hardest dish to prepare because each of the 13 vegetables had to be prepared differently so it took a lot of time and effort to get right. 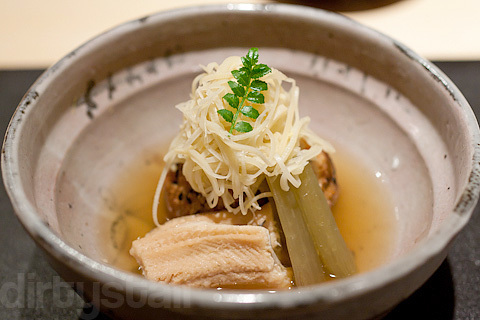 The soups in kaiseki are typically clear broth, subtle in its flavour. It is not like Chinese soups, packed full of different flavours. Here they try to let you appreciate the quality of the dashi being used to make the soup. 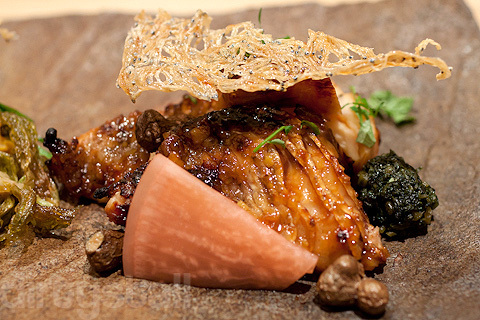 It was once said that one of the judging criteria for a restaurant was its dashi, because so many other dishes required the dashi as a base, if you felt the dashi used in the soup was good, then the rest of the dishes would have a good foundation as well. 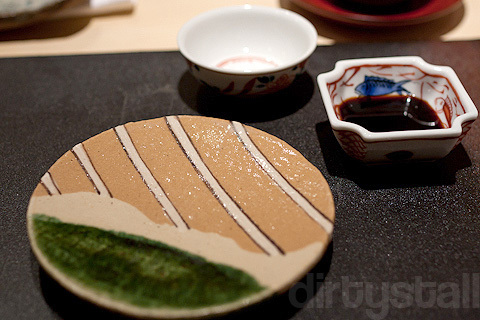 It’s another reason why soup is served early on in the kaiseki course. Accompanying the soup inside was ainame, also known as fat greening. It’s a seasonal fish and pretty rare to find as well because it prefers rocky shores with high salt water. A very clean-tasting fish. 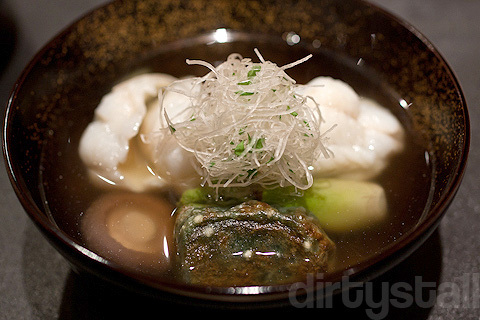 There was also a yomogi-fu inside, that dark brown green blob at the closer edge of the bowl. This is a mugwort gluten cake, something seasonal and traditional in Japan. It’s made by putting together mugwort gluten, shiitake mushrooms and shrimp. Judging by all the other reviews of Koju out there, chef Okuda almost always serves the 3 same types of sashimi for any kaiseki dinner; not that it’s a bad thing, sometimes you want to just focus on getting the best kind of sashimi and can be hard if that’s changing all the time according to season. 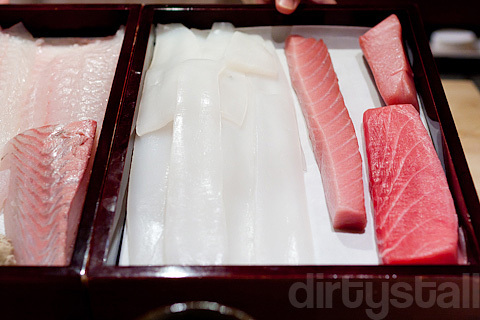 Before starting he showed me the box containing the sashimi he would be slicing out for me, long glistening strips of fresh meat. Then he proceed to slice and plate them out nicely. And here is my plate of sashimi: hirame, aori-ika and kuro-maguro toro. They were served with a pinch of sea salt, a wedge of sudachi and some wakame seaweed. And of course aged soy sauce and some grated fresh wasabi. The reason for all this was that chef Okuda instructed us to mix & match the multiple slices of sashimi with different combinations of condiments, and I think the best was the sea salt & sudachi combination for the squid, seaweed for hirame and just soy sauce for the toro. 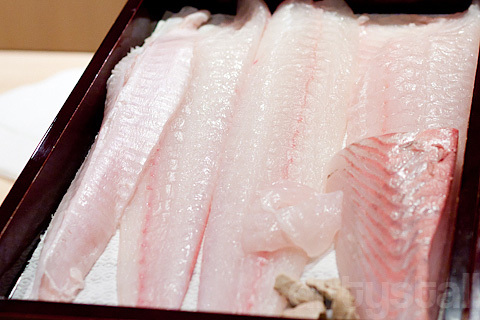 The hirame (flounder) was slightly on the lean side as it was the winter season and this gave it a clean and firm texture. Chef Okuda was also kind enough to include the engawa which is the dorsal fin muscle and it’s a prized price of meat usually only offered to regulars because there’s so little of it per fish. 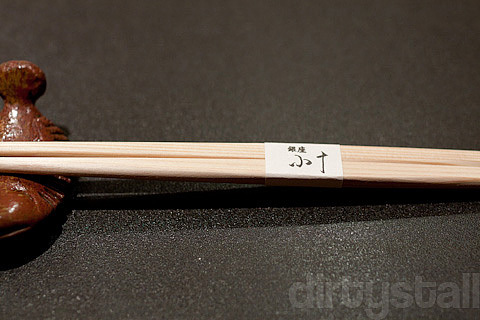 It’s more fatty and chewy than the rest of the hirame, giving it a richer flavour. The aori-ika (big-fin reef squid) was quite the revelation. I had good ika before at Sushi Saito but the ika at Koju was even better. It was fresh, sweet and juicy, and combining it with a dash of lime and salt really enhanced the quiet flavour of the ika. It has been pretty hard to convince my friends that raw squid can taste so good though. And of course I don’t think I have to say much about the toro (tuna belly) because everyone has heard so much about them, except this was really a perfect piece of toro. Just pure buttery smoothness in my mouth! I was alerted to the next course when I saw these 2 misshapen yellow chunks in front of me, representing part of the grilled food course which is shown below. This is a course of 2 parts: ise ebi with uni batter and akamutsu in miso yuan-yaki style, both topped with tatami iwashi. The way of plating the food was meant to represent mountains, with the sardine sheets as the clouds that normally obscure the mountain tops. 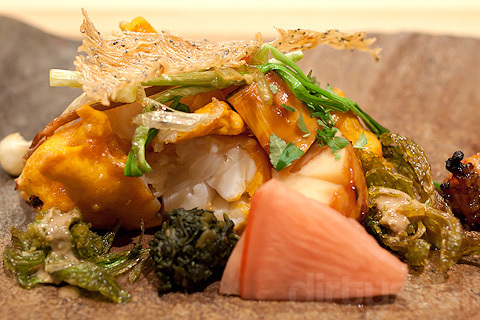 The lobster with sea urchin batter is one of those dishes which is really simple but full of flavour. A large lobster tail was first grilled over binchō-tan charcoal, which doesn’t produce smoke and burns at a much lower heat. The lower heat means it took longer to cook hence the chef already put the lobster on the grill after I sat down. 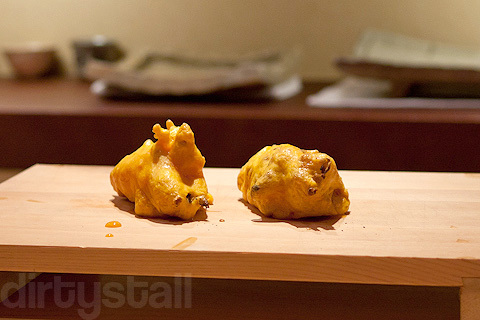 After grilling it, he coated it quickly with a thin layer of uni batter and fried it tempura style. I’ve got to say there’s few things better than biting into a juicy chunk of grilled lobster with the accompanying flvaour of lightly fried uni on the side. Because the lobster was cut into large cubes after tempura, each piece only had some of the uni batter on it and wasn’t too intense. Akamutsu refers to the yellow-striped ruby snapper, which is a rare and expensive catch because it is only found deep down in the ocean. It differs from the other types of red snapper because it has a more fatty and tender flesh. Here it was prepared in the traditional miso yuan-yaki style, where the fish is marinated with miso, yuzu, sake, mirin & soy sauce, then grilled. The yuzu gives it a nice and subtle kick to the flavours. This was a dish that I could not appreciate as much as I should have because I don’t like all the ingredients in it except for the boiled anago. 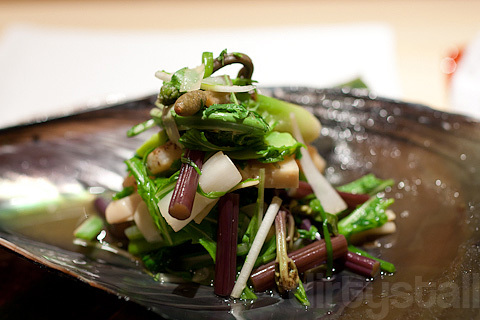 The other items in the dish was the ganmodoki, or deep-fried tofu patty, shredded takenoko or young bamboo shoot, and huki, or the actual Japanese butterbur plant. 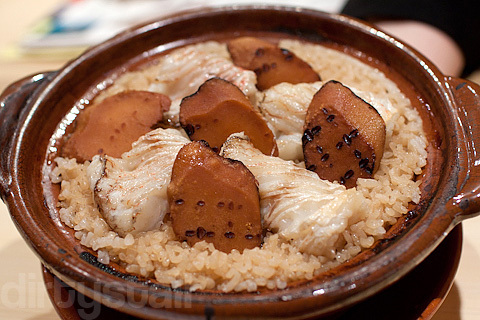 This is the traditional rice dish to end the kaiseki before dessert, a big clay-pot of steamed rice with generous chunks of amadai and grilled karasumi. 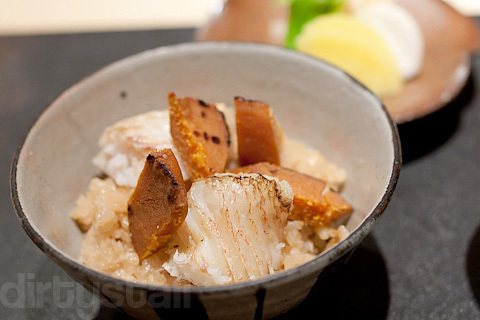 The amadai, also known as tilefish, was deliciously grilled, tender but lighter in texture than tai. This went pretty well with the grilled pieces of karasumi, the dried mullet roe that’s a expensive delicacy in Japan. The smoky and salty flavour of the karasumi really made the rice so much more tastier and it complimented the grilled amadai as well. One of the best gohan dishes I’ve had in a long time. 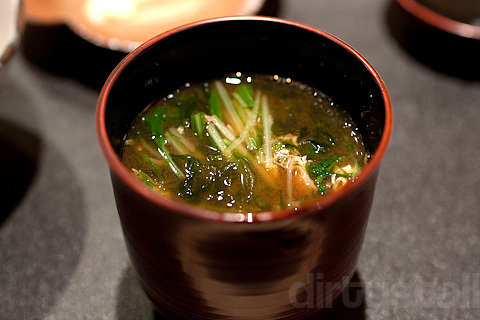 And of course, there’s miso soup, although it was presented more like in a cup than a bowl. Finally, there’s dessert! 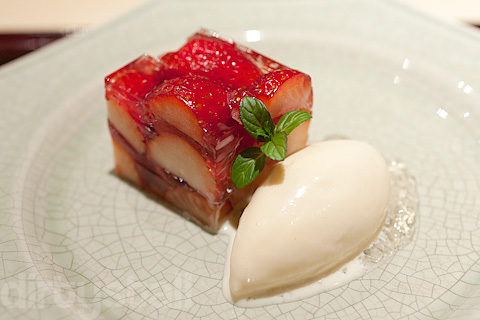 Chef Okuda kept it very simple, it was just strawberries with vanilla ice-cream, which is actually my favourite combination! Not much I can actually say except that these were some of the freshest and sweetest strawberries I’ve ever eaten. And that’s the end of an amazing kaiseki dinner, probably the best one I’ve ever had and a real highlight of my trip to Tokyo. The minimalist approach of Koju really focuses the experience on the quality of the food and the subtle flavours expressed through it. 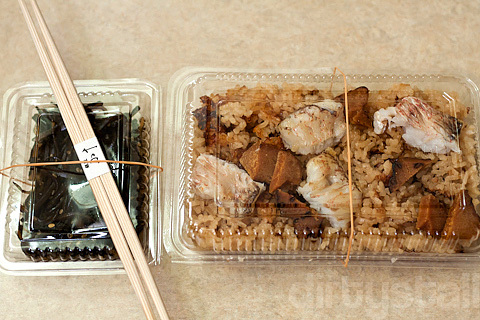 A nice touch was for them to packet the rice that I couldn’t finish together with extra seaweed so that it became my (delicious) breakfast for the next day. What a review!! After so (abt 3 weeks) you have such a review!! =) Very informative! and nice pictures. How much was the meal? Thanks for the compliments! Hahaha yah I really had a lot to say about this meal! This was their most expensive meal, I think 24000 yen or something like that. 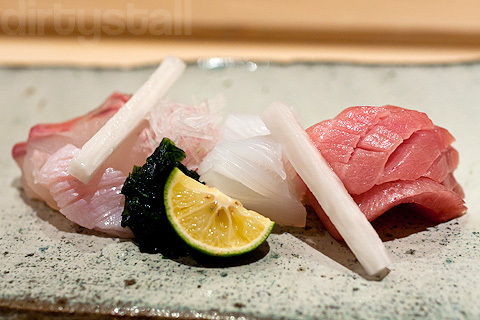 Hi Aromes, I would suggest Sukiyabashi Jiro, Les Creations de Narasawa, Ristorante Aso, Ryugin, Sawada and Sushi Saito. Hi, is there any dress code for Koju? I didn’t really check but I don’t recommend turning up in beach wear. Smart casual should be fine.